Hearing directly affects your relationships, and there’s one relationship that can be affected more than any other, your marriage. One of the biggest reasons for discord in marriage is miscommunication. We need quality communication in order to build intimacy in relationships and to solve problems or conflicts. The person with hearing difficulties typically has a certain amount of stress from the beginning. Often, they are already feeling on edge and not their best, because they’re missing out on activities or not catching all of the details in conversation. They feel increased anxiety, confusion, irritability, and could be experiencing depression. The spouse also can feel strain because they feel they are not being listened to. It can be frustrating to have to repeat yourself over and over or yell in order to be heard. When someone becomes defensive about their hearing difficulties or refuses to acknowledge the problem, it can build a lot of resentment. Spouses can also feel depression, frustration, and loneliness. The ability to handle conflict or resolve tension is important in any relationship, but when one person struggles with the ability to communicate, that can put even more stress on the relationship. Addressing and acknowledging the hearing loss will help pave the way for more effective communication. A big step will be to get tested and fitted for hearing devices, if needed. This will eliminate a lot of the stress that comes from miscommunication. It’s also important to make sure that you’re communicating in a well lit, low noise environment, especially for important conversations. Making sure that your lips can be read and your face seen will maximize your communication efforts. Finally, talk to your audiologist. 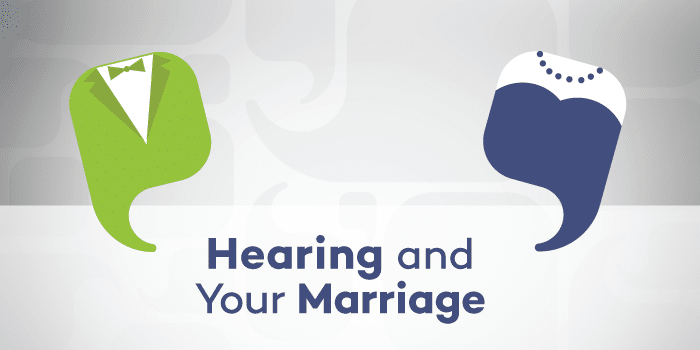 While they are not official marriage counselors, the doctors at Complete Hearing will give you additional communication tips to make sure that your conversations are as productive as possible. No one enjoys being misunderstood or not appreciated. Taking steps to work on your communication will help lay the groundwork for a happy and healthy relationship.